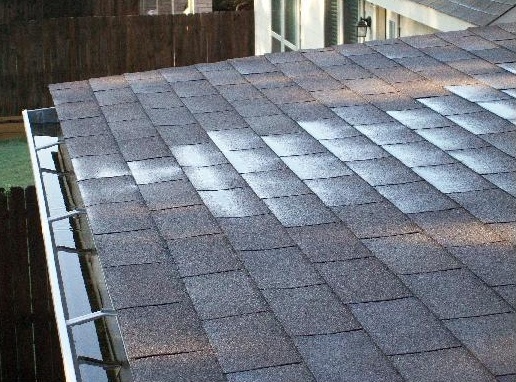 Water should not stand on a SLOPED roof! Our home inspector saw water standing on a low-sloped roof at this Fort Worth Builder Warranty inspection. The home owner had paid a local contractor to build a screened-in back porch addition. 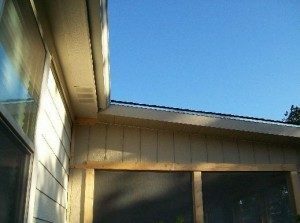 Why Was the Water Staying on a Sloped Roof? 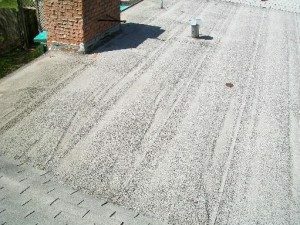 The problem was that the new patio roof did not have enough pitch (slope) for water too run off efficiently, and some water just stayed around until the sun got hot enough for it to evaporate. But, what if it’s too cold, or too wet to evaporate. Well, it will just stay for a while. Manufacturers put instructions on every bundle of shingles saying NOT to use these type of shingles on a roof that has less than a 2 1/2″ rise in 12″. But that didn’t stop our contractor. We recommended to the home owner that she ask the contractor to return and replace the roof covering, and we offered to help her talk to him. If a roof rises less than 2.5″ in a 12″ depth, manufacturers make a material called “rolled roofing,” and give specific instructions on how to install it. The photo above shows a typical installation of rolled roofing over a low-sloped roof, and the house in that photo had no problems inside. Call House Exam Inspection if you are planning, or if you recently started, a home remodeling project. We can work with you and your contractor. Often it’s just a matter of checking every few days on the progress of the work. We are the leading Builder Warranty Inspection company in Fort Worth. We will help you prepare a list of problems your builder should fix before your warranty runs out. Or, just call if you have a general question. If we don’t know hte answer right away, we’ll find it for you. We work for YOU, not your contractor.